Unsustainable fishing has been identified as the most pervasive of all local threats to coral reefs.ref Over 55% of the world’s reefs are threatened by overfishing and/or destructive fishing. Some regions, such as Southeast Asia, are particularly threatened, where nearly 95% of reefs are affected. In fact, many of the world’s most remote coral reefs are heavily fished. ref Reef fisheries are an important source of food and livelihood for many coastal communities worldwide. In some cases, these fisheries are well managed and can be a sustainable resource. However, fish stocks are increasingly threatened due to numerous factors including increased demand for fish and seafood products; more efficient fishing methods; inadequate management and enforcement; and lack of alternative livelihood options. Overfishing (i.e., catching more fish than the system can support) leads to declines in fish populations, ecosystem-wide impacts, and impacts on dependent human communities. 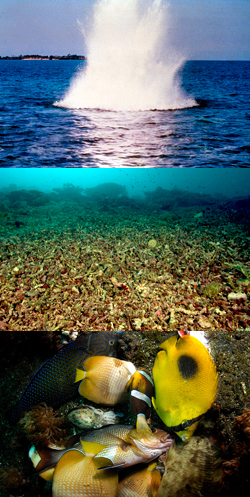 Destructive fishing methods include the use of explosives to kill or stun fish, which destroys corals. This method, called blast or dynamite fishing, shatters coral colonies and kills the coral tissues on adjacent colonies. Because blast fishing is limited to shallower parts of the reef, these vulnerable zones can be reduced to rubble by repeated blasts, making recovery difficult or impossible and destroying large sections of reef. Another destructive fishing method involves the use of cyanide to stun and capture fish alive for the live reef food fish or aquarium fish markets. Cyanide that is sprayed or dumped on reefs can damage and kill corals. In addition, fishers often break corals when attempting to extract the stunned fish, causing further damage to the coral reef ecosystem. Unfortunately, about one-third to one-half of fish collected using this method die soon after they are harvested, ref making this a particularly destructive method of harvest. Some types of fishing gear, including gill nets and beach seines, can also damage reef ecosystems. These types of fishing gear drag along the ocean floor and capture or flatten non-targeted juvenile species and corals in their path. Abandoned fishing gear, such as lost traps or nets, can continue “ghost fishing,” i.e., ensnaring prey and smothering corals for months or years after deployment. ref Abandoned nets can also entangle and dislodge corals due to wave action. Additionally, scuba and hookah diving have opened up deeper areas to fishers of sea cucumbers, pearl oysters, lobsters, octopus, fishes, seashells, and corals. Destructive fishing methods like dynamite, gill nets and beach seines are highly unsustainable because they typically do not target particular fish species and often result in juveniles being killed in the process. Damage to the coral reef structure further reduces the productivity of the area, thus adversely affecting both the reef-dependent fish populations and also the livelihoods of fishers and nearby communities. Such impacts are exacerbated when combined with other coral reef threats such as climate change, coral disease, and land-based sources of pollution. A number of management strategies to address overfishing and destructive fishing have been identified including the establishment of no-take areas within MPAs, seasonal closures to protect breeding sites, restrictions on number of people allowed to fish, types of fishing gear used, and the quantities or sizes of fish that can be harvested. Read more about reef fisheries.